The best rock stars of the sixties captured in some of their most brilliant moments during the communal experience called Woodstock, the most celebrated rock concert of all time. The film version, which runs over three hours, manages to capture the unique spirit of the once-in-a-lifetime event, and in turn, captured the mood of an entire era. 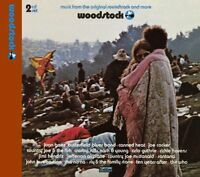 Includes amazingly volatile performances by Richie Havens, Joan Baez, The Who, Sha Na Na, Joe Cocker, Country Joe and The Fish, Arlo Guthrie, Crosby, Stills and Nash, Ten Years After, Santana, Sly and the Family Stone, Jimi Hendrix, Canned Heat, John Sebastian, Jefferson Airplane, and Janis Joplin. Immediate payment of £6.69 is required. Amazing compilation on 4DVD's of, in my opinion, THE GREATEST MUSIC FESTIVAL of the last millennium ! ! The DVD set includes additional material not included in the original festival film which I remember being screened on TV some years ago. Highly recommended music memorabilia for ageing rockers - like myself - with what are now regarded as classic performances by so many, many artists - some who, sadly are no longer with us (e.g. Joe Cocker) & many (e.g The Who) who, thankfully, still are ! ! ! It's also a 'time capsule' - illustrating USA fashion style/trends of the period, plus a moving commentary on the 'anti - (Vietnam) - war" movement in the States at that time expressed through popular music. 5 star product - fantastic ! Good quality sound & vision, diverse range of artists to capture the flavour of possibly the biggest event in music history, I vaguely remember it happening but most certainly remember the impact it had in the following years. Modern festival goers - take note of the primitive stage lighting and facilities, note the big hole appearing onstage as big Bob the Bear bounces around! Good testimony to the end of the 60s and some of the wishy-washy American bands, highlights for me are The Who sequences, Alvin Lee, and some rare decent footage of the much-underrated and sadly short-lived Janis Joplin. Oh, and Joe Cocker's broad 'With a little help from mi friends'! 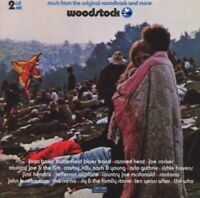 Great documentary film of the classic Woodstock festival. Plenty to get through with 4 discs in the box. 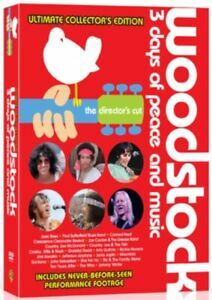 Very happy with Woodstock DVD.